Visiting the yearly Prague Patchwork Meeting is always a pleasure. Not only to see and marvel at all the different quilts on exhibition (classical, modern or art quilts), but also to get up to date with sewing, longarm quilting and embroidery machines. Plus to visit all the shops with fabrics and notions, threads and rulers and much more. A few of the shops stock Kaffe Fassett design fabrics and I decided to expand this particular fabric collection with some new designs. Provided I start using them to make quilts…. 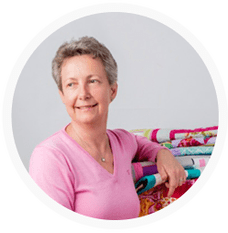 Said and done : when I came back home I got out all my Kaffe Fassett fabrics and was shocked about the amount of the different designs that came together over the years. So where shall I start? My favorite fabric (and I bought enough in Prague) is Corsage in Gold with the wonderful flower design and a warm golden background. Each flower can be cut out separately, leaving you with a 6,5″ x 6,5″ square panel. The quilt designed by Kaffe Fassett with this particular fabric is called Alba Quilt and can be purchased as a quilt kit. I decided to go for my own design and finally got a vision about the finished quilt. I wanted to combine the flower panel and a log cabin block. To unify the two blocks I selected a wonderful warm deep purple linen texture fabric from Makower. I used the linen texture for the center of the log cabin and to frame the flower panel. Both blocks ended up 8,5″ x 8,5″ unfinished. A quick comment about Makower fabrics : I have worked with them on my Fancy Forrest quilt and all the fabrics have a very good quality. The fabrics are thin but woven densely, have a smooth and lightly shimmering surface, the colors are shiny. When sewing they do not fray and can be pressed easily. Quilted with the walking foot in diagonal lines following the quilt pattern. Backing fabric in orange hues with a flower pattern. Straight-grain binding in solid bright orange fabric pieced attached with the walking foot from back to front. I have donated this quilt and a few others to the Easy Horse Care Rescue Centre. For my next post I shall prepare a pdf pattern for this quilt including block dimensions and cutting instructions – so stayed tuned ! This entry was posted in my quilts, patchwork, quilts and tagged finished quilt, Kaffe Fassett, log cabin, machine quilting. Love this one, especially. So colorful! Gorgeous quilt. I do like Kaffe’s fabrics. A beautiful quilt; the purple fabric was a perfect unifier.. I love shopping with a plan! Thanks, I already had the purple fabric on my mind when I got the flower panels. It matches well with the golden background of the flowers. This is a beautiful quilt you made, Barbora ! Thanks, Annett, nice to hear from you. Hope all is well and you are busy with your crafting projects!